Different and personal interpretations of TRUE LOVE. So which one resonated the most with voters? We shall now find out. Thanks to everyone who cast their vote, especially our 2018 Theme Contest Judge RICKY LADIA. Cheers! Way to go, back-to-back! Congratulations, RY JACINTO! Safe to say that you're off to a great start. 1st Place gets an extra 10 points, 2nd Place gets 7, 3rd Place gets 5, 4th Place (undisclosed) gets 3, and 5th Place (also undisclosed) gets 2 points for the 2018 Photographer Of The Year competition. Participants automatically get 3 points for submitting entries. Up next : March PhotoMeet Contest. Film-style photowalk! 3rd Place : 24 points (11 votes) / Entry 16 / MAYNARD PASAKDAL, JR.
Four Focus applicants made the Top 5, spearheaded by our winner, RY JACINTO. Congratulations! We don't usually announce the 4th and 5th placers but since this is unprecedented in terms of applicants' finish : 3rd placer Maynard Pasakdal, 4th placer Rachele Lacson, and 5th placer Hans Aliwalas are also applicants. Way to go, hopefuls! 1st Place gets an extra 10 points, 2nd Place gets 7, 3rd Place gets 5, 4th Place gets 3, and 5th Place gets 2 points for the 2018 Photographer Of The Year competition (points will only be recorded for official members). Participants automatically get 3 points for submitting entries. Thanks to everyone who voted, including our guest judge Ruben Ranin who cast his vote all the way from Surigao. Till our next photomeet! 2016-17 Competition Officer Amen Alcoriza is taking on a new role, this time as Logistics Officer for 2018. He is now eligible to enter and join the Focus competition, with no restrictions. 2013-2015 Competition Officer Jer Sandel is now back to handle the club's competition, as Competition Officer for 2018. Like last year (2017), he is not eligible to enter Focus Bulacan's competition. He may, however, join the PhotoWorld Cup competition in representing Focus Bulacan, the Scott Kelby Worldwide Photowalk contest, and other national/international contests that are not organized by Focus Bulacan. 2017 PhotoWorld Cup Adviser Joey Ramos reprises his role for 2018 and will be a non-participant in Focus Bulacan's PhotoWorld Cup screening contests. He may, however, join Focus Bulacan's PhotoMeet and Theme contests. Monthly PhotoMeet contests shall continue. Photo entries for these contests will be shot during designated monthly PhotoMeets of Focus Bulacan. There shall be 10 PhotoMeet contests for 2018 : one for every month except May, July, and December, plus a special PhotoMeet to be announced during the course of the competition. Our regular theme contest is back! Back in 2013-2016, themes were assigned randomly and announced at the beginning of each month. Photo entries for a specific month's theme contest should be taken during that same month, with old/stock photos not allowed in the contest. However, in 2017, with Focus Bulacan joining the PhotoWorld Cup, the monthly contest themes were synchronized with the PhotoWorld Cup-given themes. This year, our previous theme contest format is back. Themes will be announced at the beginning of each month. Photo entries must be shot/taken during the same month. Old/stock photos will not be allowed. All images must be taken from 2017 to 2018 only. Previously published (in print or in social media) photos are not allowed. Photos that previously won local and international awards prior to monthly theme judging will be disqualified. in connection with the annual International PWD (Persons With Disabilities) Day. Anything that depicts "reduce, reuse, recycle". Can be one, two or all of the 3 Rs. - March 24 - “Glass and Crystal” and "The Coconut Song"
- April 28 - "House of Worship"
- July 28 - "Bawal"
Please send high-resolution copy of your photo entry (as opposed to photomeet and theme contest requirement of resizing it for web). We need high-res files of entries, as they will get printed for the FPPF PWC competition . Post-processing is allowed, unless stated otherwise. Entries will be screened by Competition Officer Jer Sandel and PhotoWorld Cup Adviser Joey Ramos. Approved entries will be printed and submitted to the national PhotoWorld Cup judging. (Example : "HOUSE OF WORSHIP ENTRY"
For PWC contests, Competition Officer and PWC Adviser will select the entries for submission to the national PWC judging. 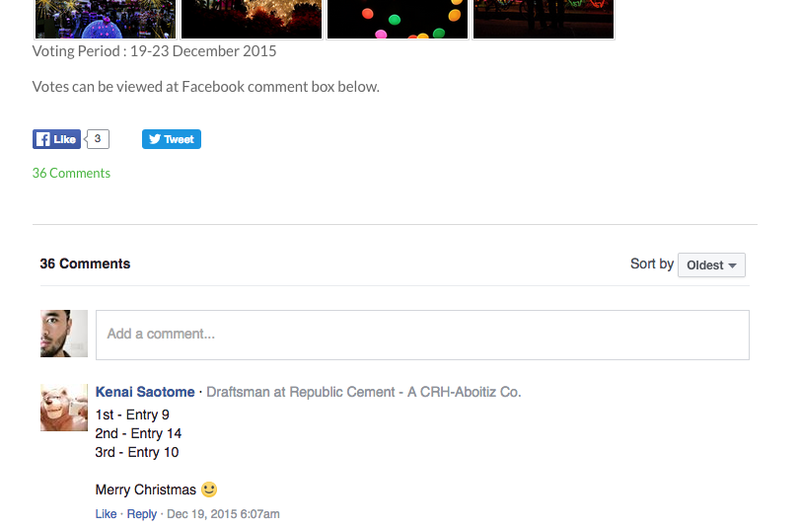 For 2018 photomeet and theme contests, we will use public comment voting system where votes will be posted as comments on the website contest page. You have to use your personal Facebook account in order to vote. The comment section is at the bottom of the contest page, click HERE to get the idea. We strongly encourage voters to offer critique along with their votes. Voting mechanics are also published whenever a contest is posted for voting. Please report cases of vote solicitation or vote influencing to Competition Officer Jer Sandel. Rest assured that your report will be handled confidentially. Unlike the previous year when we had a panel of 3 judges for each type of contest, for 2018 we shall have one guest judge for photomeet contests and one guest judge for theme contests. Each judge's votes will count for 10 points for their 1st place picks, 7 points for 2nd place picks, and 5 points for 3rd place picks. Each guest judge will be asked to vote in every photomeet or theme contest. All points will be tracked and recorded. The Focus member who has the most points at the end of 2018 will be recognized as Photographer Of The Year.